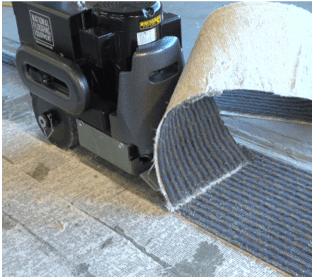 The Preparation Group is pleased to announce that it has partnered with National Flooring Equipment in the USA, to supply its Scraping machines. The eight models offered have globally proven designs, incorporating innovative technology for high downforce and removal rates with reliability and easy operation. With a wide variety of accessories, including different blade and shank configurations, they provide the ultimate solution for removing rubber, vinyl, carpet, ceramic and terrazzo tiles, waterproofing systems, screeds and more. The range comprises of a small walk-behind 550 Scraper, ideal for residential projects and when working in confined spaces, through to larger walk-behind and ride-on models for big, challenging projects. All designs are compact for transportation, storage and to fit through standard doorways.